Adam is the clinical manager of the Methuen location. He earned his Doctorate of Physical Therapy from the MGH Institute of Health Professions. 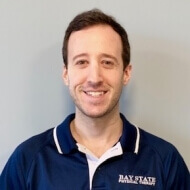 He is committed to working closely with his patients while using his knowledge of biomechanics to help them fully understand how to avoid recurring injuries, ensure they meet all of their physical therapy related goals, and optimize their performance both in the home and on the field. He focuses his practice in evidence-based, individualized treatment plans combining manual therapy and functional exercise to maximize his patients’ rehabilitation potential. In addition to his physical therapy degree he is also a Certified Strength and Conditioning Specialist. Originally from the north shore of Boston, Adam graduated from Indiana University with a degree in music business and worked in sales and in the music industry before changing his career to physical therapy. In his free time, he enjoys spending time with friends and family, attending concerts, playing basketball and golf, and watching all Boston sports teams.